Switched front porch and back deck seating back in April and FINALLY have the vintage metal deck chairs repainted. It took me awhile to figure out what I wanted, then forever to get them painted - at least it felt like forever. The days I had available to work it rained, or the wind blew (not real good to spray paint in strong wind). Then it rained some more or there was more wind. I could only do about one chair a day - between the time delay for coats of paint and my energy level. I got the last one finished today and I'm pleased with the results. So here's what you see when you walk out onto the deck. Couldn't get it all in one picture, so there are two. The green chair behind the glider is set up to be Boots (cat) bed - but you'll notice he's opted for the floor during these warm days. It's a nice dry/warm place when it's cool though. He has an enclosed bed that he slept in the first couple of winters but refused to use it last year. The chair on the left in the first picture is PURPLE. I couldn't get it to look nearly as pretty as it actually is. 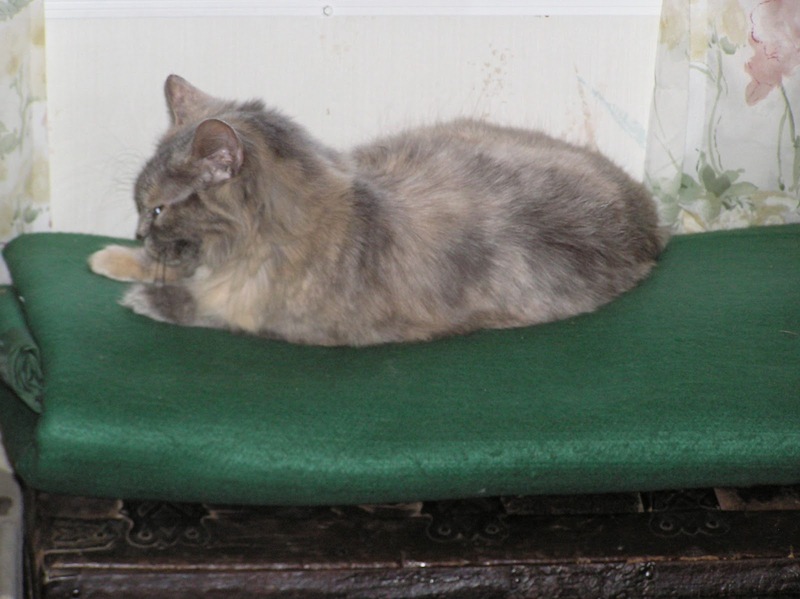 I've had the glider for 20+ years - it was one we rescued - originally painted green, I painted it blue when I first got it and it was easier just to repaint it the same color again. The chairs were my parents - so they're probably almost as old as I am (and that's old). I'd painted them all blue too - don't ask, blue isn't my favorite color. I think it had something to do with DH's tastes. NOW, they're lots of bright, happy colors - purple, green, orange, red and yellow. I'm lovin' them! This is the purple chair - love purple. So, plenty of good places to sit and enjoy the pleasant summer. Now remember, I'm about 3 years older than dirt, and I'm not up on ALL the new technical stuff though I do try and stay current on many things and have a reasonable knowledge of "some" things technical. I just haven't posted anything here. 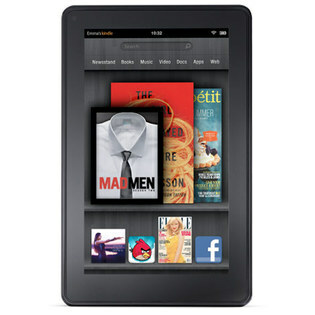 So, I have a Kindle Fire - it's the first generation fire and I got it not long after they came out and I LOVE IT!!! I can check email, facebook, browse the web (if there's wifi), but mostly I just read books on it. That being said, I wanted to share this info in the event anyone else might be interested. And, since I spent a day and a half searching online for the answer, only to read many blogs and forums that did NOT supply the correct (or at least updated) info. I've known all along that I could check out books from the library for the Kindle, just never attempted it - so decided to try it. Found my library online with Overdrive (the online service). Entered my card number, found a couple of books I wanted to try and checked them out. That's when I realized I might have a problem. One book was in "Kindle" format and so easy it was like eating pie. The other one was in some strange format I wasn't familiar with and not compatible with my Kindle. That lead me to check further and I discovered many of the books the library offered were not in Kindle format. So, there had to be an answer and I started searching. Found I could read them on my PC by downloading Adobe Digital Editions (free) - but I didn't want to read them on my PC. Found all kinds of info on how to convert them for my Kindle - none of which worked for me. Maybe I was doing something incorrectly, but nonetheless it didn't work. It was bedtime by then, so I stopped searching till the next day. But, I woke determined and walla - I found the answer. Again, as simple as eating pie but nowhere in any of the info that I read did it mention THIS... but here it is. Amazon offers an app Overdrive Media Console (it's free). Simply download it to your Kindle and install it. At some point it'll ask you to 'authorize' via Adobe Digital Editions. If you don't have a registration login with them, it'll give you the option to set one up. Do so, authorize and download your book. Now, I believe you have to read it in the app - which looks a bit different than your normal Kindle books do, but there are settings to change font size, etc. So, today, I'm a happy camper. My book is in my Kindle waiting for me to read. AND, I have a whole 'wish list' on my library website that I'll get to eventually. Thursday, 7/4/13 - now there's good news AND more good news... Boots is back home. He arrived about an hour ago - ate a bowl full of food and is now sleeping soundly in a living room chair. He's lost weight, but otherwise seems to be okay. Well, there's good news and there's bad news. The good news is that Fluffy is doing well with her medication, and I've even found a treat that she likes - it's called "Lickety Stik" and is a salmon flavored liquid she can lick off my finger or off the little roller ball on the bottle. It's the FIRST thing I've found that she'll touch and it took several days for her to try it, but now she loves it. She's being really good for her meds and gets treat licks after her medication both morning and evening. She knows too and she's ready for that treat. He's been gone since last Friday (5 days today). He's ALWAYS there in the morning for breakfast - even if he had a 'treat' earlier (he's a hunter). He spent time Friday afternoon in the living room reclining in a comfy chair but was ready to go out at bedtime. That's the last we've seen him. I pray he's not somewhere hurt and is just off on a safari!